European dry heathland is a protected habitat type (german: Lebensraumtyp, LRT) listed in the Habitats Directive of the European Union. Characteristic for this habitat type is low vegetation dominated by common heath (Calluna vulgaris) at various stages (pioneer, development, maturation and degeneration phase) with few or no trees. Often the heathland is intersected with patches of dry sandy grassland and open sandy soils, both which can be very rich in mosses and lichens. Other typical plant species in heathlands are dwarf shrubs (Genista spec. ), spring-flowering annuals, various grasses and the occasional trees such as pine (Pinus sylvestris), sand birch (Betula pendula) and oak (Quercus robur x petraea). In addition, there are many characteristic bird species, including the hoopoe (Upupa epops), the woodlark (Lullula arborea), the wheatear (Oenanthe oenanthe) and reptiles such as the common European viper (Vipera berus) and the sand lizard (Lacerta agilis). Furthermore there are numerous invertebrate animals such as the heather mining-bee (Andrena fuscipes), the heather colletes (Colletes succinctus), the heath bush-cricket (Gampsocleis glabra), the blue-winged grasshopper (Oedipoda caerulescens), the lesser mottled grasshopper (Stenobothrus stigmaticus), the heather beetle (Lochmaea suturalis), as well as ground beetles, bugs, butterflies and many more. Many of these species specialize in and depend on the common heath as a habitat or food crop. Heather dominated plant societies colonize on nutrient-poor, acidic soils and require direct light and open sandy spots for re-juvenation (germination). Nutrient inputs and succession, i. e. growth of woody plants, cause a decline in typical heathland species. 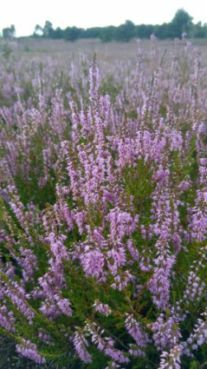 Even heather itself, in particular without appropriate management, ensures non-reversible soil changes and thus lead to a change in vegetation and species composition. Man-driven management and maintenance of heathland, therefore, is of essential importance for preservation and a highly structural diversity within the heathland.